The pinnacle of human first-person achievement. Never, since, have we so boldly gone. ... and we, as a species, have been on the decline ever since. My premise is simple. 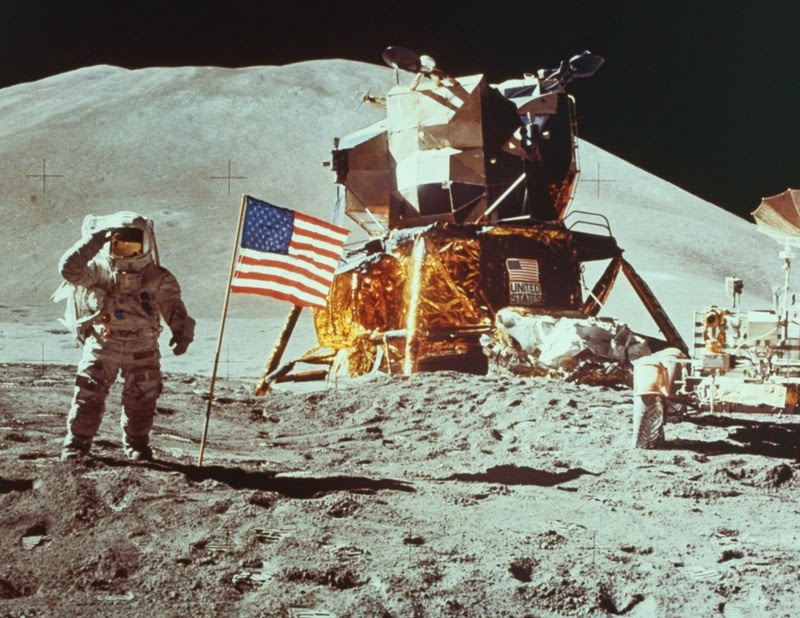 I could write a book elaborating the details (and I might), but in a nutshell it is this: Real, first-person human experience has been steadily retreating since men stood on the moon. The frontiers of human physical accomplishment have been abandoned, and the wilderness is creeping back in. In one of the last truly epic promises made and delivered by a politician, on May 25, 1961, President John F. Kennedy announced his plans to send a man to the moon within the decade. On July 20, 1969, Neil Armstrong fulfilled this promise. Man has not gone that far since. We've retreated from the physical frontier of real first-person experience. The above statements imply a pessimistic prediction: that we will never go back to the Moon, and surely never send men to Mars. The current government shutdown in the US is a perfect example of why. Leaders have become increasingly petty, wasting time and energy butting heads rather than working to advance the quality of life of their voting constituents. Corporate entities spend billions to influence voters to their cause, and voters, increasingly lacking enough broad, honest first-person physical experience of life, are ever more vulnerable to swallowing the distorted virtual-worlds depicted in the corporate/political propaganda. It's Huxley's 'hypnopædia' brought to life. Now, private corporations might ultimately be the future successful space pioneers. And if they do succeed, I'll happily admit my error. There are quite a few serious private space programs being developed. The problem is that ultimately no corporation can assure a sufficiently stable growing economy necessary to provide financial backers and paying clients for space travel. It takes government to do that--and the across-the-board cooperation that only (good) government can sustain. Corporations are intrinsically cutthroat and competitive with one another, and they seem to be doing their best to infiltrate government and steer it toward their dismal self-serving mindset. First: Many may argue that since the 1960's, medicine has made magnificent progress curing and controlling health problems. Major medical progress began long ago with surgery and antibiotics. Since the 1960's we have decoded the human genome and are able to begin to target specific problems with a precision never before thought possible. My counter-argument is this: *all* of the things we call medical intervention are actually physical setbacks to the vigor and strength of the human physical being. We are sustaining the weak and encouraging them to propagate. My argument is that the average human being's *intrinsic/potential* health was at its greatest long ago, when we had only our body's built-in natural defenses to combat disease and injury. Only the strongest genes survived to propagate. The populations of those times were much more concentrated with people of great valor and prowess, capable of accomplishing the epic deeds that nowadays we can only fawn over in video games and movies. Yes, since the 1960's humans have pushed forward the boundaries of a few specialized physical accomplishments, but some of that is not natural--it is technology-aided. And overall, the numbers of these physical achievers, as a percentage of the total population, had precipitously decreased. The obesity epidemic is just one glaring example. Second: In a similar vein to society's introduction of medical intervention and its effect on average human *potential* health, society's invention of the 'rule of law' intervening to bypass personal responsibility, has led to a deterioration in the average human's *potential* moral strength. As world populations grew, the tight-knit extended family unit (clans, tribes, villages) grew into cities. And cities were only manageable by means of the establishment of laws and government. Humans began to be held accountable to an impersonal 'code' rather than to the real first-person influence of their village sages, shamans, and elders.